Our collection includes many rare stones and, from time to time, some truly world-class gems. In 2012 we were especially lucky to acquire several such gems, including an 11.55 ct red imperial topaz and and a 75 ct yellow star sapphire. The latest ultra-rare gem in our collection is an 11.16 ct purple star spinel from Tanzania. Any spinel displaying the star effect is very rare, but high quality specimens over 5 carats are almost unheard of. But this amazing gem goes beyond rare -- in addition to its large size it also has outstanding body color AND incredible transparency. Spinel has many similarities to ruby and sapphire. They are similar in chemical composition -- spinel is magnesium aluminum oxide while corundum is aluminum oxide -- and they tend be found in the same geological formations. While corundum is a bit harder than spinel (9 vs 8 on the Mohs scale), spinel is a very durable gem suitable for any kind of jewelry. 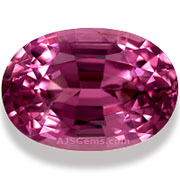 Best of all, while heat treatment is routine for corundum, spinel is rarely, if ever, heated. Spinel is actually rarer than sapphire and star spinels are much rarer than star sapphires or star rubies. In fact we rarely ever see a star spinel of any size or quality. Earlier this year Arnold happened to be in Tanzania at the right time when an exceptional large star spinel was discovered and we are lucky to add it to our collection. This very fine star spinel is 11.16 carats in weight and slightly more than 12 mm in diameter. It is almost perfectly round with a depth of 7.6 mm. The body color is a rich purple reminiscent of grape jelly, with a sharp star that appears under a strong focussed light. 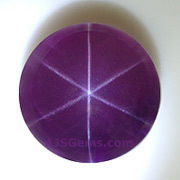 The color consistency is excellent and the gem is not just translucent, but transparent. We had this star spinel tested by both GIA (Gemological Institute of America) and GRS (GemResearch Swisslab). It was certified as natural and unheated, with origin identified as Ceylon (Sri Lanka). This month we feature fine spinels from our collection, including gems from Burma, Tanzania and Vietnam. 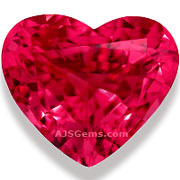 The neon pink-red spinel discovered near Mahenge in Tanzania in 2007 is the finest spinel every discovered. We still have some stock from the original deposit, including this gorgeous 5.91 ct heart. 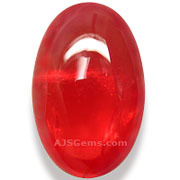 Certified as natural and unheated with color "vivid pinkish-red" by GemResearch Swisslab (GRS). See the video. A lovely pink-orange spinel from Vietnam. 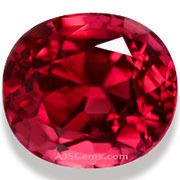 The color is reminiscent of padparadscha sapphire. At over 5 cts, this quite a rare gem, nicely cut and full brilliance and luster. 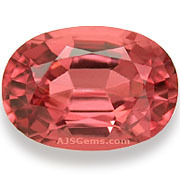 An unusual reddish-orange spinel cabochon with outstanding color saturation and transparency. A one-of-a-kind gem that will make a gorgeous ring or pendant. Red is the classic color for Burma spinel, but a pure stoplight red is very hard to find. This 2.01 ct beauty is a bright and fiery gem with flashes of pure red. Very clean and well cut. A luscious large purple spinel from Burma, nearly 4 cts. Very good crystal with excellent clarity (graded "almost loupe clean"). This year we'll be exhibiting at two venues at the annual gem show in Tucson. We'll be at the GJX show, Feb 5-10, in booth #2300. We'll also be exhibiting at the Pueblo show at the Riverpark Inn, Feb 2-14, in show room #146. We look forward to seeing you if you plan to be in Tucson. The world's first ETF (Exchange Traded Fund) to focus on diamonds and gemstones has been launched by PureFunds on the NYSE Arca under the trading symbol GEMS. The fund invests exclusively in companies that produce, refine, sell or hold gemstone inventory, in an effort to overcome traditional impediments to investment in gemstones as assets such as the absence of spot and futures markets. The fund will follow the performance of the ISE Diamond/Gemstone Index, which includes the largest and most liquid companies that produce, explore and sell gemstones. The Mohs hardness scale was developed in 1821 by Friedrich Mohs, a German mineralogist. It actually measures hardness by testing scratch resistance. Minerals are compared by testing which materials can be scratched by others. The result is a ranking of materials, starting with the hardest, diamond, at 10. The scale is relative, so it tells us that diamond is harder than sapphire (9) and sapphire is harder than topaz (8), but it doesn't tell us how much harder. In fact the differences are variable -- diamond is about 4 times harder than sapphire, but sapphire is only twice as hard as topaz. While topaz is also twice as hard as quartz (ranked 7th), quartz is actually only 25% harder than orthoclase (ranked 6th). Gem silica, a form of chalcedony colored by copper, is the rarest and most valuable form of quartz. There are several quality grades, based on color and translucency. The vivid turquoise color is the most sought after by collectors, especially the rare translucent specimens that come mainly from the Inspiration Mine in Arizona. The material from Peru tends towards a bluish green, but some of the best Peruvian material also has considerable translucency. The gem silica from the Ray Mine in Arizona has an intense blue color, but is usually opaque.